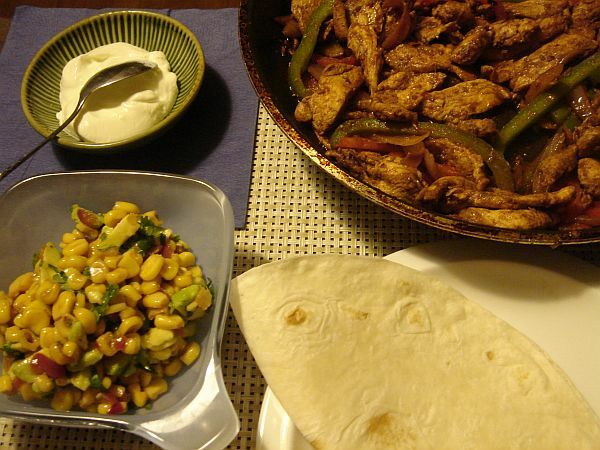 Cucina Povera: Fajitas can be made from your pantry, not just a packet. Fajitas can be made from your pantry, not just a packet. I used to really love a brand of 'make at home' Mexican food, available from the supermarket. Without naming the brand directly, Marty Robbins sings about falling 'in love with a Mexican girl' in this 'Old' town... Get my drift? Anyway because I have this weird aversion to preservatives and ingredients labelled with numbers I always try to find a way to make my own versions of the store-bought ones. I usually find that the ones I make taste better. The best part is that the ingredients are really simple - they use basic spices most people use often or have lurking in the back of their pantry anway. I love Fajitas and these ones taste really light and are full of flavour. I even lighten them up a little by using European yoghurt in place of sour cream. They go really well with the corn salsa as well. Enjoy! Mix paprika, cumin, chili and cayenne together in a bowl. Add enough oil to make into a runny paste (about 2 tbs should loosen it up enough). Put chicken fillet slices into a bowl and pour over spice paste. Mix thoroughly to coat well. Put your frypan on high heat *do not add oil to the pan* add your chicken and cook for 5-6 minutes, until the chicken is cooked through. Add peppers and onion and turn along with the chicken, until the vegetables soften slightly. Turn the heat off and squeeze in the juice of 1/2 a lime. Mix well and season to taste. (The lime juice gives the chicken a nice twang and mixes with the juices to make a nice thick gravy). For the Corn Salsa - Heat a frypan with 1 tbs olive oil. Add corn, onion and chili and cook until onion is softened (about 5 mins). Remove from heat and allow to cool for about 5 mins. Add the juice of half a lime, along with the cucumber, avocado and chopped coriander. Mix to combine. *This salsa, mixed with grated cheese makes a great filling for Quesadillas too. Warm tortillas in a microwave oven or a warm dry pan. Serve Fajitas with yoghurt and salsa. I can honestly say that I have never felt more "satisfied" after a late lunch than one of the times Ms. Kitty made her magically tangy fajitas for me. ANOTHER Yummy dish! I LOVE Mexican almost as much as Italian (My Personal Favorite). You are SO multi-faceted as a Cheffy!